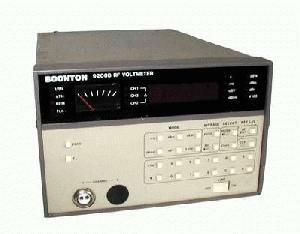 The 9200 RF Millivoltmeter is a microprocessor controlled meter, that measures rf voltage from 200 µV to 3 V in the 10KHz to 1.2GHz range (300 V to 700MHz with 91-7C divider). Voltage probe data is stored in a nonvolatile memory. Has 4 digit display that reads in mV or dB.